Ian Russell McEwan CBE FRSA FRSL (born 21 June 1948) is an English novelist and screenwriter. In 2008, The Times featured him on its list of "The 50 greatest British writers since 1945" and The Daily Telegraph ranked him number 19 in its list of the "100 most powerful people in British culture". McEwan began his career writing sparse, Gothic short stories. The Cement Garden (1978) and The Comfort of Strangers (1981), his first two novels, earned him the nickname "Ian Macabre". These were followed by three novels of some success in the 1980s and early 1990s. His novel Enduring Love (1997) was adapted into an eponymous film. He won the Man Booker Prize with Amsterdam (1998). His following novel, Atonement (2001), garnered acclaim and was adapted into an Oscar-winning film starring Keira Knightley and James McAvoy. This was followed by Saturday (2005), On Chesil Beach (2007), Solar (2010), Sweet Tooth (2012), The Children Act (2014), and Nutshell (2016). He was awarded the Jerusalem Prize in 2011. McEwan was born in Aldershot, Hampshire, on 21 June 1948, the son of David McEwan and Rose Lilian Violet (née Moore). His father was a working-class Scotsman who had worked his way up through the army to the rank of major. McEwan spent much of his childhood in east Asia (including Singapore), Germany, and north Africa (including Libya), where his father was posted. His family returned to England when he was 12. He was educated at Woolverstone Hall School; the University of Sussex, where he received a degree in English literature in 1970; and the University of East Anglia, where he undertook a master's degree in literature (with the option to submit creative writing instead of a critical dissertation). McEwan's first published work was a collection of short stories, First Love, Last Rites (1975), which won the Somerset Maugham Award in 1976. He achieved notoriety in 1979 when the BBC suspended production of his play Solid Geometry because of its supposed obscenity. His second collection of short stories, In Between the Sheets, was published in 1978. The Cement Garden (1978) and The Comfort of Strangers (1981), his two earliest novels, were both adapted into films. The nature of these works caused him to be nicknamed "Ian Macabre". These were followed by his first book for children, Rose Blanche (1985), and a return to literary fiction for The Child in Time (1987), winner of the 1987 Whitbread Novel Award. Following The Child in Time, McEwan began to move away from the darker, more unsettling material of his earlier career towards the style that would see him reach a wider readership and gain significant critical acclaim. This new phase began with the publication of the mid-Cold War set espionage drama The Innocent (1990) and Black Dogs (1992), a quasi-companion piece reflecting on the aftermath of the Nazi era in Europe and the end of the Cold War. McEwan followed these works with his second book for children, The Daydreamer (1994). His 1997 novel, Enduring Love, about the relationship between a science writer and a stalker, was popular with critics, although it was not shortlisted for the Booker Prize. It was adapted into a film in 2004. In 1998, he won the Man Booker Prize for Amsterdam. His next novel, Atonement (2001), received considerable acclaim; Time magazine named it the best novel of 2002, and it was shortlisted for the Booker Prize. In 2007, the critically acclaimed movie Atonement, directed by Joe Wright and starring Keira Knightley and James McAvoy, was released in cinemas worldwide. His next work, Saturday (2005), follows an especially eventful day in the life of a successful neurosurgeon. Saturday won the James Tait Black Memorial Prize for 2005, and his novel On Chesil Beach (2007) was shortlisted for the 2007 Booker Prize. McEwan has also written a number of produced screenplays, a stage play, children's fiction, an oratorio and a libretto titled For You with music composed by Michael Berkeley. In 2006, McEwan was accused of plagiarism; specifically that a passage in Atonement (2001) closely echoed a passage from a memoir, No Time for Romance, published in 1977 by Lucilla Andrews. McEwan acknowledged using the book as a source for his work. McEwan had included a brief note at the end of Atonement, referring to Andrews's autobiography, among several other works. The incident recalled critical controversy over his debut novel The Cement Garden, key elements of the plot of which closely mirrored some of those of Our Mother's House, a 1963 novel by British author Julian Gloag, which had also been made into a film. McEwan denied charges of plagiarism, claiming he was unaware of the earlier work. Writing in The Guardian in November 2006, a month after Andrews' death, McEwan professed innocence of plagiarism while acknowledging his debt to the author of No Time for Romance. Several authors defended him, including John Updike, Martin Amis, Margaret Atwood, Thomas Keneally, Kazuo Ishiguro, Zadie Smith, and Thomas Pynchon. McEwan's first novel of the 2010s, Solar, was published by Jonathan Cape and Doubleday in March 2010. In June 2008 at the Hay Festival, McEwan gave a surprise reading of this work-in-progress. The novel includes "a scientist who hopes to save the planet" from the threat of climate change, with inspiration for the novel coming from a Cape Farewell expedition McEwan made in 2005 in which "artists and scientists...spent several weeks aboard a ship near the north pole discussing environmental concerns". McEwan noted "The novel's protagonist Michael Beard has been awarded a Nobel prize for his pioneering work on physics, and has discovered that winning the coveted prize has interfered with his work". He said that the work was not a comedy: "I hate comic novels; it's like being wrestled to the ground and being tickled, being forced to laugh", instead, that it had extended comic stretches. Solar was followed by McEwan's twelfth novel, Sweet Tooth, a meta-fictional historical novel set in the 1970s, and was published in late August 2012. In an interview with The Scotsman newspaper to coincide with publication, McEwan revealed that the impetus for writing Sweet Tooth had been "[...] a way in which I can write a disguised autobiography". He revealed in an interview with The Wall Street Journal, in November 2012, that the film rights to Sweet Tooth had been bought by Working Title Films—the company that had brought Atonement to the screen. Sweet Tooth was followed two years later by The Children Act, which concerned High Court judges, UK family law, and the right to die. The release of The Children Act was marred by a public controversy when McEwan's estranged ex-wife made an unexpected appearance at a public publicity event that McEwan was participating in to promote his novel; she heckled McEwan, and demanded, "When are you going to lift the injunction you have on me and my partner?". Although McEwan recognized his ex-wife's presence, he did not directly respond, and she was escorted from the premises. McEwan's most recent novel is Nutshell, published in 2016, a short novel closer in style and tone to his earlier works. McEwan's next work, a short novella, is titled My Purple Scented Novel – part of which was previously published as a short story under the same title in The New Yorker in 2016 – is to be published to mark McEwan's 70th birthday in June 2018. McEwan has been nominated for the Man Booker prize six times to date, winning the Prize for Amsterdam in 1998. His other nominations were for The Comfort of Strangers (1981, shortlisted), Black Dogs (1992, shortlisted), Atonement (2001, shortlisted), Saturday (2005, longlisted), and On Chesil Beach (2007, shortlisted). McEwan also received nominations for the Man Booker International Prize in 2005 and 2007. He is a Fellow of the Royal Society of Literature, a Fellow of the Royal Society of Arts, and a Fellow of the American Academy of Arts and Sciences. He was awarded the Shakespeare Prize by the Alfred Toepfer Foundation, Hamburg, in 1999. He is also a Distinguished Supporter of Humanists UK. He was awarded a CBE in 2000. In 2005, he was the first recipient of Dickinson College's Harold and Ethel L. Stellfox Visiting Scholar and Writers Program Award, in Carlisle, Pennsylvania. In 2008, McEwan was awarded the honorary degree of Doctor of Literature by University College London, where he had previously taught English literature. In 2006, the Board of Trustees of the Kenyon Review honored McEwan with the Kenyon Review Award for Literary Achievement, writing that "McEwan's stories, novels, and plays are notable for their fierce artistic dramas, exploring unanticipated and often brutal collisions between the ordinary and the extraordinary." In 2008, The Times named McEwan among their list of "The 50 greatest British writers since 1945". In 2010, McEwan received the Peggy V. Helmerich Distinguished Author Award. The Helmerich Award is presented annually by the Tulsa Library Trust. On 20 February 2011, he was awarded the Jerusalem Prize for the Freedom of the Individual in Society. He accepted the prize, despite controversy and pressure from groups and individuals opposed to the Israeli government. McEwan responded to his critics, and specifically the group British Writers in Support of Palestine (BWISP), in a letter to The Guardian, stating in part, "There are ways in which art can have a longer reach than politics, and for me the emblem in this respect is Daniel Barenboim's West-Eastern Divan Orchestra – surely a beam of hope in a dark landscape, though denigrated by the Israeli religious right and Hamas. If BWISP is against this particular project, then clearly we have nothing more to say to each other." McEwan's acceptance speech discussed the complaints against him and provided further insight into his reasons for accepting the award. He also said he will donate the amount of the prize, "ten thousand dollars to Combatants for Peace, an organisation that brings together Israeli ex-soldiers and Palestinian ex-fighters." In 2012, the University of Sussex presented McEwan with its 50th Anniversary Gold Medal in recognition of his contributions to literature. In 2014, the Harry Ransom Center at the University of Texas paid $2 million for McEwan's literary archives. The archives includes drafts of all of his later novels. McEwan commented that his novel Atonement started out as a science fiction story set "two or three centuries in the future." In 2008, McEwan publicly spoke out against Islamism for its views on women and on homosexuality. He was quoted as saying that fundamentalist Islam wanted to create a society that he "abhorred". His comments appeared in the Italian newspaper Corriere della Sera, to defend fellow writer Martin Amis against allegations of racism. McEwan, an atheist, said that certain streams of Christianity were "equally absurd" and that he didn't "like these medieval visions of the world according to which God is coming to save the faithful and to damn the others." In 2007, Christopher Hitchens dedicated his book God Is Not Great to McEwan. In 2008, McEwan was among more than 200,000 signatories of a petition to support Italian journalist Roberto Saviano who received multiple death threats and was placed in police protection after exposing the Mafia-like crime syndicate, Camorra, in his 2006 book Gomorrah. McEwan said he hoped the petition would help "galvanize" the Italian police into taking seriously the "fundamental matter of civil rights and free speech". McEwan also signed a petition to support the release of Sakineh Mohammadi Ashtiani, an Iranian woman sentenced to death by stoning after being convicted of committing adultery. On winning the Jerusalem Prize, McEwan defended himself against criticism for accepting the prize in light of opposition to Israeli policies, saying: "If you didn't go to countries whose foreign policy or domestic policy is screwed up, you'd never get out of bed". On accepting the honour he spoke in favour of Israel's existence, security, and freedoms, while strongly attacking Hamas, Israel's policies in Gaza, and the expansion of Israeli settlements in the occupied territories—notable words, for the audience included political leaders such as the Israeli President Shimon Peres and Nir Barkat, the Mayor of Jerusalem. McEwan also personally attended a protest in Sheikh Jarrah against the expansion of Israeli settlements. In 2013, McEwan sharply criticised Stephen Hawking for boycotting a conference in Israel as well as the boycott campaign in general, stating that there are many countries "whose governments we might loathe or disapprove of" but "Israel–Palestine has become sort of tribal and a touchstone for a certain portion of the intellectual classes. I say this in the context of thinking it is profoundly wrong of the Israeli government not to be pursuing more actively and positively and creatively a solution with the Palestinians. That's why I think one wants to go to these places to make the point. Turning away will not produce any result." In 2009, McEwan joined the 10:10 project, a movement that supports positive action on climate change by encouraging people to reduce their carbon emissions. In 2013, as part of a wide-ranging interview with Channel 4 News, McEwan reflected upon the furore that surrounded his remarks on Islamism in 2008, stating "I remember getting a lot of stick five or six years ago saying something disobliging about jihadists. There were voices, particularly on the left, that thought anyone who criticised Islamism was really criticising Islam and therefore racist. Well, those voices have gone quiet because the local atrocities committed by Islamists whether in Pakistan or Mali is so self-evidently vile." In the same interview, McEwan remarked that he felt that protestors of the 2003 Iraq War were "vindicated" by what happened subsequently; argued that the chief legacy of the Iraq War was that "[...] sometimes there are things we could do [before that war] which we no longer can" in foreign affairs; stated that at one point prior to the 2003 invasion he had hoped to be able to seek an audience with Tony Blair to persuade him not to go ahead with the war; and as someone who voted for the Liberal Democrats in the 2010 UK general election, that the current coalition government of the United Kingdom should end, stating "Let's either have a Tory government or let Ed Miliband try something different", to try and turn around a country of "great inequity". McEwan is traditionally a Labour supporter and said he had his "fingers crossed" that Miliband would become Prime Minister. Following the referendum on the United Kingdom's membership of the European Union resulting in a win for the Leave or 'Brexit' campaign in June 2016, McEwan wrote a critical opinion article for The Guardian newspaper titled "Britain is changed utterly. Unless this summer is just a bad dream", published on 9 July 2016. In the article, McEwan attempted to make sense of the aftermath and consequences of the 'Brexit' vote, noting: "Everything is changed utterly. Or about to be, as soon as your new leader is chosen. The country you live in, the parliamentary democracy that ruled it, for good or bad, has been trumped by a plebiscite of dubious purpose and unacknowledged status. From our agriculture to our science and our universities, from our law to our international relations to our commerce and trade and politics, and who and what we are in the world – all is up for a curious, unequal renegotiation with our European neighbours." McEwan's piece appeared to conclude with a sense of bewilderment and unease at how events were panning out, anticipating the ascension of Theresa May to the leadership of the Conservative Party and her appointment as Prime Minister, and noting how the previously unthinkable in British politics had actually happened. (McEwan's article was published on 9 July, and May effectively won the Conservative Party leadership contest on 11 July, which precipitated her appointment as Prime Minister two days later). In May 2017, speaking at a London conference on Brexit, apparently referring to what he believed to be the older demographic of leave voters, McEwan stated that 'one and a half million oldsters freshly in their graves' would result in a putative second referendum returning a 'remain' outcome. McEwan has been married twice, first to Penny Allen, then later to Annalena McAfee, who was formerly the editor of The Guardian's Review section. He met the English undergraduate Allen in the 1970s, while both were at the University of East Anglia; she was divorced and had two daughters. According to a Daily Mail interview with Allen in September 2014, she was married when she first met McEwan, and their relationship began after her divorce. They married in 1982: "My first wife was very New Age. I tried to accommodate it", McEwan said in 2009. The couple divorced in 1995. Allen ended the marriage because she was frustrated by McEwan's "glitterati" associations, and the dissolution of the marriage was followed by a custody dispute over their two teenage sons. Allen absconded to France in 1999 with them (accompanied by her new partner) after McEwan had gained sole custody, although the elder boy soon returned to his father to visit Botswana with him. Following a Brittany court ruling that their other son should be returned to his father, McEwan gained an injunction at the High Court in London against his former wife in September of that year, preventing her from speaking about the case. During the hearing, the judge, Mr Justice Charles, ordered the ruling of Paul Clark, the judge at the custody hearing at Oxford County Court, to be read out. The judge at the Oxford hearing had referred to Allen's "vitriolic campaign" against her ex-husband, and also commented: "When thwarted by him [McEwan] or others she has not hesitated to make trouble - witness her 'press releases' in various articles in the press earlier this year ." In October 2014, when he was giving a talk at the Cheltenham Literature Festival to publicise his new novel, The Children Act, Ms Allen was reported as asking in the question-and-answer session, "When are you going to lift the injunction you have on me and my partner?" She was escorted out of the event by the stewards. In 2002, McEwan discovered that he had a brother who had been given up for adoption during the Second World War; the story became public in 2007. The brother, a bricklayer named David Sharp, was born six years earlier than McEwan, when their mother was married to a different man. Sharp has the same parents as McEwan but was born from an affair between them that occurred before their parents' marriage. After her first husband was killed in combat, McEwan's mother married her lover, and Ian was born a few years later. The brothers are in regular contact, and McEwan has written a foreword to Sharp's memoir. McEwan was a long-time friend of Christopher Hitchens, the writer and polemicist. ^ "The 100 most powerful people in British culture". The Daily Telegraph. 9 November 2016. ^ "Ian McEwan". Film reference. Retrieved 26 August 2011. ^ Cooke, Rachel (19 August 2012). "Ian McEwan: 'I had the time of my life'". The Guardian. ^ Walsh, John (27 January 2007). "Ian McEwan: Here's the twist". The Independent. London. Retrieved 22 March 2007. ^ Knorr, Katherine (9 October 1997). "Enduring Love". International Herald Tribune. Archived from the original on 30 March 2008. Retrieved 22 March 2007. ^ "Ian McEwan's Family Values". Boston Review. Retrieved 21 March 2007. ^ "Prize archive: 1998". Man Booker Prize. Retrieved 7 July 2010. ^ Cowell, Alan (28 November 2006). "Eyebrows Are Raised Over Passages in a Best Seller by Ian McEwan". The New York Times. ^ Julia Langdon (25 November 2006). "Ian McEwan accused of stealing ideas from romance novelist". Daily Mail. London. Retrieved 7 July 2010. ^ Alan Cowell (28 November 2006). "Eyebrows Are Raised Over Passages in a Best Seller by Ian McEwan". The New York Times. Retrieved 7 July 2010. ^ Ian McEwan (27 November 2006). "An inspiration, yes. Did I copy from another author? No". The Guardian. London. Retrieved 27 November 2006. ^ Hoyle, Ben (27 November 2006). "McEwan hits back at call for atonement". The Times. London. Retrieved 27 November 2006. ^ "McEwan accused of copying writer's memoirs". PR inside. Archived from the original on 26 March 2007. Retrieved 27 November 2006. ^ Reynolds, Nigel (6 December 2006). "Recluse speaks out to defend McEwan". The Daily Telegraph. London. Retrieved 25 April 2010. ^ Bell, Dan (6 December 2006). "Pynchon backs McEwan in 'copying' row". The Guardian. London. Retrieved 25 April 2010. ^ "Solar". Ian Mcewan's Website. Archived from the original on 25 August 2011. Retrieved 26 August 2011. ^ a b c Soal, Judith (2 June 2008). "McEwan sees funny side of climate change in novel reading". The Guardian. London. Retrieved 2 April 2010. ^ a b Farndale, Nigel (7 March 2011). "Ian McEwan interview". The Daily Telegraph. London. ^ "Sweet Tooth" Archived 3 May 2012 at the Wayback Machine, at IanMcEwan.com. ^ Chai, Barbara (27 October 2012). "Working Title Secures Film Rights to Ian McEwan's New Novel, 'Sweet Tooth'". The Wall Street Journal. ^ Stock, Jon (3 May 2013). "Ian McEwan: John le Carré deserves Booker". The Telegraph. ^ "Ian McEwan 'heckled by ex-wife' at book promotion". Telegraph.co.uk. Retrieved 3 February 2017. ^ McEwan, Ian (21 March 2016). ""My Purple Scented Novel"". Retrieved 28 March 2018 – via www.newyorker.com. ^ "My Purple Scented Novel by Ian McEwan". www.penguin.co.uk. Retrieved 28 March 2018. ^ "Man Booker". Themanbookerprize.com. Archived from the original on 19 August 2011. Retrieved 26 August 2011. ^ "Ian McEwan". Contemporary Writers. British Council. Archived from the original on 17 June 2006. Retrieved 3 June 2006. ^ "Poet Inspires Dickinson College Alumna's $1.5 Million Gift". Archived from the original on 5 February 2011. ^ "Kenyon Review for Literary Achievement". KenyonReview.org. ^ Hosking, Patrick; Wighton, David (5 January 2008). "The 50 greatest British writers since 1945". The Times. London. Retrieved 1 February 2010. ^ "the jerusalem prize". Jerusalem Book Fair. Retrieved 13 February 2011. ^ "McEwan defends decision to accept Jerusalem Prize." Jewish Journal. 26 January 2011. 26 January 2011. ^ Bates, Stephen (19 January 2011). "Ian McEwan says he will accept Jerusalem prize". The Guardian. London. ^ "Ian McEwan should turn down the prize". The Guardian. London. 27 January 2011. ^ "Israel critics should respect my decision" The Guardian, 26 January 2011. ^ a b "Jerusalem Prize Acceptance Speech". Ianmcewan.com. Archived from the original on 2 August 2011. Retrieved 26 August 2011. ^ "Sussex awards gold medals to its world-leading alumni and past academics", University of Sussex, News, 13 July 2012. ^ "Ransom Center Pays $2 Million for Ian McEwan Papers", The New York Times, 16 May 2014. ^ Solomon, Deborah (2 December 2007). "A Sinner's Tale". The New York Times. Retrieved 2 April 2010. ^ Popham, Peter (22 June 2008). "'I despise Islamism': Ian McEwan faces backlash over press interview". The Independent. London. Retrieved 25 June 2008. ^ Ian McEwan (26 June 2008). "McEwan Addresses Recent Statement on Islamism". ian-mcewan.blogspot.com. Retrieved 7 July 2010. ^ Flood, Alison (24 October 2008). "Ian McEwan condemns 'thuggery' of Neapolitan mafia". The Guardian. UK. Retrieved 26 August 2011. ^ "Palestinian writers shun Ian McEwan over Israel honour". Reuters. 18 February 2011. ^ Harriet Sherwood in Tel Aviv (18 February 2011). "McEwan to accept Israeli book award but criticise occupation". The Guardian. UK. Retrieved 26 August 2011. ^ "RCW". Rcwlitagency.com. Archived from the original on 29 August 2011. Retrieved 26 August 2011. ^ "Ian McEwan attacks Israeli policies | Jerusalem prize". Sydney Morning Herald. 22 February 2011. Retrieved 26 August 2011. ^ Gordon, Evelyn (20 February 2011). "Ian McEwan joins left-wing protest in Sheikh Jarrah". Jerusalem Post. Retrieved 26 August 2011. ^ Booth and Harriet Sherwood, "Noam Chomsky helped lobby Stephen Hawking to stage Israel boycott", The Guardian, 10 May 2013. ^ a b "Iraq war marchers 'vindicated' a decade on - Ian McEwan", 4 News, 11 February 2013. ^ a b c Ian McEwan, "Britain is changed utterly. Unless this summer is just a bad dream", The Guardian, 9 July 2016. ^ a b Daniel Zalewski "The Background Hum", New Yorker, 23 February 2009. ^ >Mick Brown "Ian McEwan interview: warming to the topic of climate change", Daily Telegraph, 11 March 2010. ^ a b Richard Kay, "Ian McEwan's bitter ex wife and why her story is even more emotionally fraught than his novels", Daily Mail, 20 September 2014. ^ Kate Kellaway "At home with his worries", The Observer, 16 September 2001. ^ Richard Reeves and Nicole Veash "A War of Words", The Observer, 22 August 1999. ^ "Novelist's ex-wife 'gagged'". BBC News. 7 September 1999. Retrieved 3 June 2006. ^ Terri Judd "Novelist victim of 'vitriolic campaign'", The Independent, 10 September 1999. ^ Tim Jones and Michael Harvey "McEwan's former wife twisted the truth, says judge", The Times, 10 September 1999. ^ Hannah Furness "Ian McEwan 'heckled by ex-wife' at book promotion", Daily Telegraph, 4 October 2014. ^ Cowell, Alan (17 January 2007). "Ian McEwan's life takes twist with discovery of a brother". International Herald Tribune. Retrieved 23 March 2007. ^ "Novelist McEwan discovers brother". BBC News. 11 January 2007. Retrieved 22 March 2007. ^ McEwan, Ian. "My Purple Scented Novel". New Yorker. Retrieved 25 July 2018. D'Eliva, Gaetano, and Christopher Williams, (1986), La Nuova Letteratura Inglese Ian McEwan, Schena Editore. Hoare, Liam (14 November 2012). "Ian McEwan, novelist-historian". Salon. Retrieved 19 February 2014. Pedot, Richard (1999), Perversions Textuelles dans la Fiction d'Ian McEwan, Editions l'Harmattan. Williams, Christopher (1993) Ian McEwan's The Cement Garden and the Tradition of the Child/Adolescent as 'I-Narrator Biblioteca della Ricerca, Schena Editore. Zalewski, Daniel (23 February 2009). "The Background Hum: Ian McEwan's art of unease". The New Yorker. ISSN 0028-792X. Retrieved 19 February 2014. Ian McEwan: On how to make love work in fiction. Filmed at Louisiana Literature festival 2013. Video interview by Louisiana Channel. 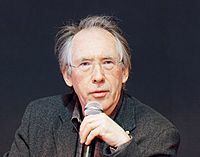 Wikimedia Commons has media related to Ian McEwan.